Fafie Moore moderated and Shauna Jo Larkin participated on a “Scripts that Win” panel at ERA Franchise Systems’ International Business Conference in Las Vegas on February 21, 2018. The course was designed to provide attendees ideas for sharing the value they bring to a real estate transaction. 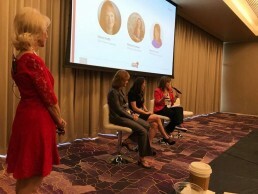 Along with Marion Proffitt and Miranda Hinchman, top producing agents within the ERA Franchise System, they shared best practices for keeping in touch with clients and developing a strong referral business.